Homicide finally gets his shot at Bryan Danielson’s ROH World Title in front of his hometown fans. The Fifth Year Festival rolls into Chicago, with a huge tag team main event! 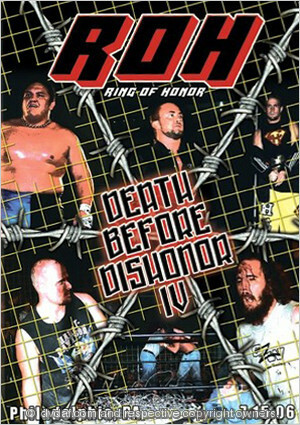 Featuring Samoa Joe, Claudio Castagnoli, SHINGO, Jimmy Jacobs, The Briscoes, and more! ROH kicks off a six-show set to celebrate their first five years! Featuring Samoa Joe vs. Takeshi Morishima and much more! Outlaw Inc vs American Wolves in tag action, then Four Corner Survival between two of ROH's best, the TV Champion and the #1 Contender to the World Title. Paul London takes on ROH mainstay Rodderick Strong, but first Tommaso Ciampa welcomes Jesse Sorensen to Ring of Honor in his own way - With knee strikes. It’s a two hour shoot interview, plus 10 complete matches featuring opponents like Davey Richards, Chris Hero, El Generico, Christopher Daniels, Roderick Strong, Homicide, and more! Check out seventeen of Austin Aries’ best matches in ROH, featuring the likes of Samoa Joe, Bryan Danielson, Roderick Strong, Davey Richards, AJ Styles, Takeshi Morishima, and more! Check out the best from the Notorious 187, including matches with Samoa Joe, CM Punk, Steve Corino, Colt Cabana, Bryan Danielson, and more!